Photo of Joshua placed near the end of the History. Joshua progresses very methodically though his family’s history, beginning with his own scant knowledge of his grandparents, stepping through parents, brothers and sisters, his own autobiography, children from two marriages and finishing with several addenda concerning his grandchildren. He writes sections based on the length of the blank journal page, beginning with a heading and subheading followed by a single page of text, whereupon he breaks the narrative flow and begins a new page with a new heading. Joshua tells the story of an Old World working class Anglo-Irish family beginning anew in North America. 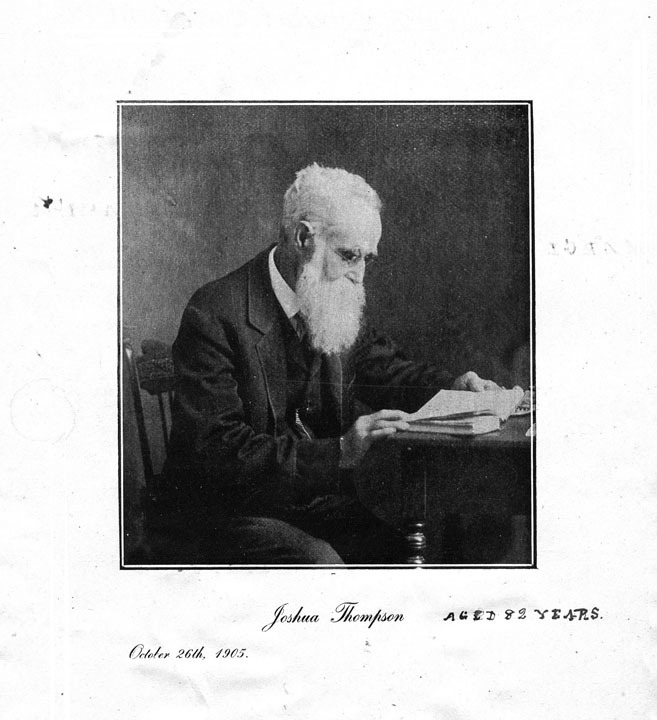 He never fully explains why the Thompson family decided to make the arduous trek in 1819 from Mountrath, a village near Dublin, across a great ocean and vast tracts of wilderness to arrive, finally, in a farming community a few miles west of Kingston, Ontario. They hoped “to make a home and a fortune for their family,” Joshua writes, as he tells the remarkable tale of the challenges endured and chances taken by these settlers in the New World. My Father did not find Canada as inviting a place for a home as he expected and consulted with my mother and they both concluded it was best to return to the states. I think he was at Mr. Baker’s two weeks. So he engaged two other teams to take them back to Cambridge [NY]. When they reached Kingston, a distance of thirty miles, they heard that the ice in the river St. Lawrence had broken up and it could not be crossed with teams so they did not proceed any further. He soon got a house for the family and unloaded the sleighs, settled with the teamsters and got the house arranged for the family. This entry was posted on October 15, 2013 at 12:14 pm and is filed under Books, Genealogy, Musings, Publishing, Writing. You can subscribe via RSS 2.0 feed to this post's comments.